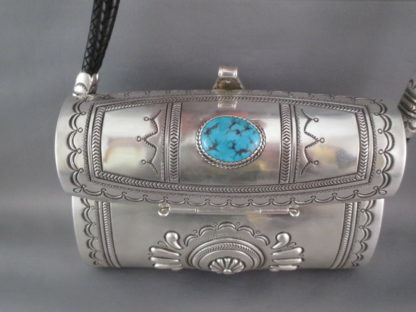 Sterling silver purse with Blue Moon Turquoise by Award-Winning Navajo jewelry artist and silversmith, Leonard Gene. Beautifully made – perfectly detailed. Exceptional hand-made purse with precision stamping and repouse work. Incredibly unique sterling silver purse with leather lined interior. Leonard also hand-braided the leather straps. Top of strap to bottom of purse = 12 1/4″. Most exceptional silversmiths would feel the urge to cover something like this with almost endless silverwork (stamping, overlay, repouse, etc.). However, here Leonard keeps the design a little bit more simple… which results in an absolutely striking visual appeal. Another wonderful silversmithing feat by Native American jewelry artist, Leonard Gene (Navajo).